A couple of weeks ago an email popped in my inbox telling me about a brand new competition taking place on Moneysupermarket.com. 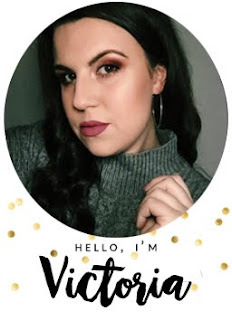 The idea of the competition is to create looks for autumn/winter by being as creative and stylish as you can, but also making it great value for money. There will be 6 winners; one for each category, winning £200 each to spend on the outfit they've put together. There will also be an overall winner who will win £1000 to spend on all five outfits, as well as an iPad. Pretty amazing huh? I absolutely love doing things like this and believe me when i say i had so much fun creating the looks, so much so I'm thinking of making it a weekly feature! Anyway, here's entry.... Wish me luck! First dates can be pretty nerve wracking at the best of times so the last thing you want to have to worry about is your outfit, which is why I've decided to keep it simple yet classy. I wanted to pick an outfit which can be worn at various places and not look out of place, such as dinner, the cinema or shopping. Neutral colours can be easily dressed up or down and mixed with any colours too so I've picked orange because it's a flirty and right on trend for A/W. Teaming it with subtle gold accessories give warmth to the outfit, along with the light weight snood. Having already worked in an office, it's apparent to me it''s not always about shirts, ties and pencil skirts. I spend my days surrounded by art workers, designers and people full of creativity so being in an an environment like this is the perfect place to let your personality shine through but keeping it professional. I've picked a patterned long sleeved dress with a cute collar, the long sleeves make it perfect for colder days and can be teamed with a blazer to give it added warmth if needed, like the thicker tights too. Black flats are perfect for the office if you're constantly up and about and going from meetings to meetings. I love this mix of colours too, navy and burgundy will be my favourite for A/W and i love this bag for pulling the colours together and making the outfit complete. 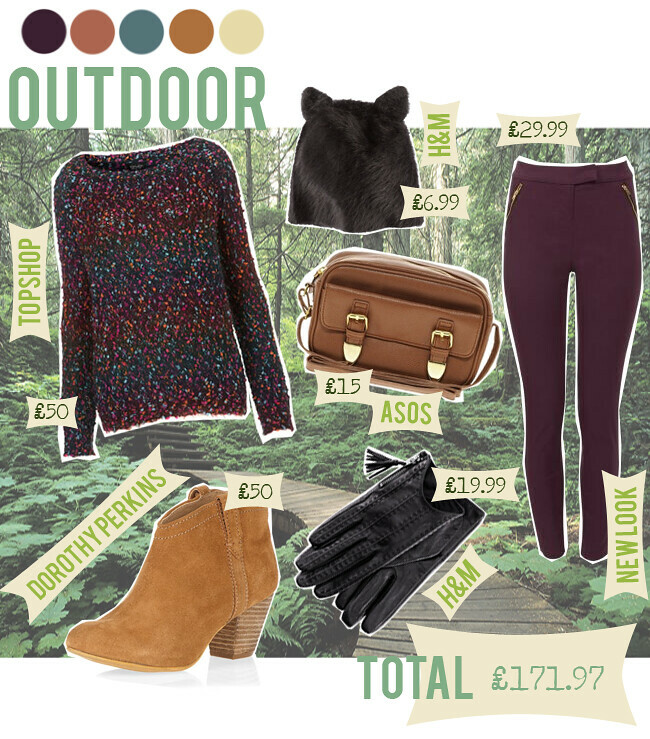 Being outdoors just got so stylish, move over rain coats and wellies I've found the perfect outfit. Ok, so maybe it's not the best outfit for trekking through the peaks, but it's perfect for a half hour walk through woodland on a Sunday afternoon. The mix of colours in the speckle jumper work with the trousers perfectly, bringing out the purple without being too much and again with the brown bag and tan boots. The detailing on the bag is lovely and it's the perfect size for all your necessities. Finishing the outfit with gloves and the cutest bear hat will keep you cosy and ready for Autumn. This is the party dress of all party dresses and fits in with the embellished trend perfectly, it's also great for all shapes and sizes too which gets a big thumbs up from me. With the leather, beading and zip details this dress just speaks for itself and deserves to be shown off at all your Christmas parties. With not wanting to take away from the greatness of this dress, I've picked black and gold accessories which compliment the dress beautifully and gives it a classic feel. The ultimate comfortable and causal outfit, designed for everyone. This style of footwear is a must have and and high street is getting well in on the trend, these ones are perfect for days when you're out and about! Keeping it pretty neutral with the grey but adding a pop of colour with the trousers and umbrella to brighten up those miserable rainy days. Focusing on the colours of this floral backpack (a trend which continues through to A/W) I've picked the studded wrap bracelet which again links the grey together. A totally cool and mega trendy outfit for every day wear! I'd love to hear what you think of the outfits I've created! Which is your favourite? I love the colour of the first pants. Amazing looks! 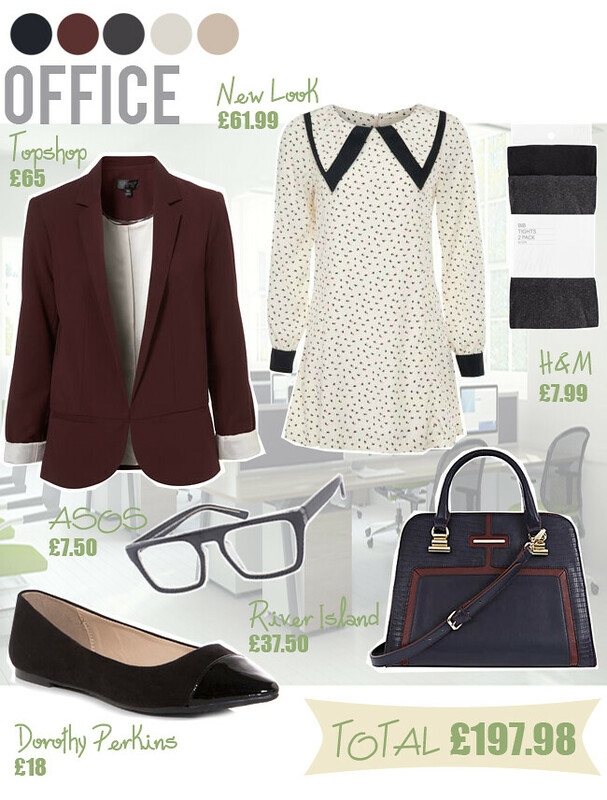 I adore the office look! I love the casual and the outdoor outfit! They're all great outfits, I especially love your choices for casual and outdoor. They're all so cool, love the first date one! I LOVE your outdoor outfit, and the backpack in the casualwear! All the outfits are lovely. My favourite must be the party one. Great entry! I love the Office outfit :) It took me agesss to chose any outfits when pretending to have money but had a great time doing it :)! I love the office look! So much so that I bought the dress after reading the post. I think it would be great if this was a weekly feature. Yay inspiration, keep it coming! I'd wear the casual look so hard. These are all lovely but your office outfit in particular is gorgeous - i'd wear that in a hearbeat! good work! I love the office look ! I love the office look!